GO TRAVEL Link Lock with solid steel cable secures your luggage to any immovable object so that it can not be stolen. 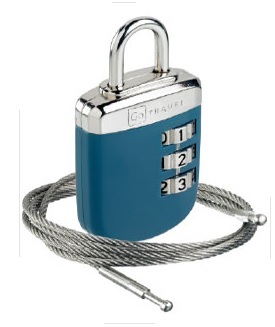 It has an encased solid brass combination suitcase lock and removable high tensile steel cable system. Solid zinc alloy and coated in tough polypropylene, this three dial lock also comes with a solid steel cable system that deters any would-be opportunist. Assorted colours available.